Wikipedia, Saracen was a term widely used among Christian writers in Europe during the Middle Ages. The term's meaning evolved during its history. In the early centuries AD, Greek and Latin writings used this term to refer to the people who lived in desert areas in and near the Roman province of Arabia Petraea, and who were specifically distinguished as a people from others known as Arabs. In Europe during the Early Middle Ages, the term came to be associated with tribes of Arabia as well. By the 12th century, "Saracen" had become synonymous with "Muslim" in Medieval Latin literature. Such expansion in the meaning of the term had begun centuries earlier among the Byzantine Greeks, as evidenced in documents from the 8th century. In the Western languages before the 16th century, "Saracen" was commonly used to refer to Muslim Arabs, and the words "Muslim" and "Islam" were generally not used (with a few isolated exceptions). 12th-century Reliquary of Saint Stanislaus in the Wawel Cathedral in Kraków is an exquisite example of Saracen art from Sicily or Palestine. The term Saraceni might be derived from the Semitic triliteral root srq "to steal, rob, plunder", and perhaps more specifically from the noun sāriq (Arabic: سارق), pl. sariqīn (سارقين), which means "thief, marauder, plunderer". Other possible Semitic roots are šrq "east" and šrkt"tribe, confederation". Ptolemy's 2nd century work, Geography, describes Sarakēnḗ (Ancient Greek: Σαρακηνή) as a region in the northern Sinai Peninsula. Ptolemy also mentions a people called the Sarakēnoí(Ancient Greek: οἱ Σαρακηνοί) living in the northwestern Arabian Peninsula (near neighbor to the Sinai). Eusebius in his Ecclesiastical history narrates an account wherein Pope Dionysius of Alexandria mentions Saracens in a letter while describing the persecution of Christians by the Roman emperor Decius: "Many were, in the Arabian mountain, enslaved by the barbarous 'sarkenoi'." The Augustan History also refers to an attack by "Saraceni" on Pescennius Niger's army in Egypt in 193, but provides little information as to identifying them. Both Hippolytus of Rome and Uranius mention three distinct peoples in Arabia during the first half of the third century: the "Taeni", the "Saraceni" and the "Arabes". The "Taeni", later identified with the Arab people called "Tayy", were located around Khaybar (an oasis north of Medina) and also in an area stretching up to the Euphrates. The "Saraceni" were placed north of them. These Saracens, located in the northern Hejaz, were described as people with a certain military ability who were opponents of the Roman Empire and who were classified by the Romans as barbarians. The Saracens are described as forming the "equites" (heavy cavalry) from Phoenicia and Thamud. In one document the defeated enemies of Diocletian's campaign in the Syrian Desert are described as Saracens. Other 4th century military reports make no mention of Arabs but refer to as 'Saracens' groups ranging as far east as Mesopotamia that were involved in battles on both the Sasanian and Roman sides. 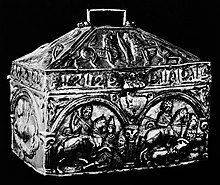 The Saracens were named in the Roman administrative document Notitia Dignitatum—dating from the time of Theodosius I in the 4th century—as comprising distinctive units in the Roman army. They were distinguished in the document from Arabs. Beginning no later than the early fifth century, Christian writers began to equate Saracens with Arabs. Saracens were associated with Ishmaelites (descendants of Abraham's older son Ishmael) in some strands of Jewish, Christian, and Islamic genealogical thinking. The writings of Jerome (d. 420) are the earliest known version of the claim that Ishmaelites chose to be called Saracens in order to identify with Abraham's "free" wife Sarah, rather than as Hagarenes, which would have highlighted their association with Abraham's "slave woman" Hagar. This claim was popular during the Middle Ages, but derives more from Paul’s allegory in the New Testament letter to the Galatians than from historical data. [clarification needed]The name "Saracen" was not indigenous among the populations so described but was applied to them by Greco-Roman historians based on Greek place names. As the Middle Ages progressed, usage of the term in the Latin West changed, but its connotation remained negative, associated with opponents of Christianity, and its exact definition is unclear. In an 8th-century polemical work, John of Damascus criticized the Saracens as followers of a false prophet and "forerunner[s] to the Antichrist." By the 12th century, Medieval Europeans had more specific conceptions of Islam and used the term "Saracen" as an ethnic and religious marker. In some Medieval literature, Saracens—that is, Muslims—were described as black-skinned, while Christians were lighter-skinned. An example is in The King of Tars, a medieval romance. The Song of Roland, an Old French 11th-century heroic poem, refers to the black skin of Saracens as their only exotic feature. In his Levantine Diary, covering the years 1699-1740, the Damascene writer ibn Kanan (Arabic: محمد بن كَنّان الصالحي‎‎) used the term sarkan to mean "travel on a military mission" from the Near East to parts of Southern Europe which were under Ottoman Empire rule, particularly Cyprus and Rhodes. Jadi Saracen di masa lalu diartikan sebagai kelompok orang kristen yang melakukan perlawanan dan membuat gerakan penolakan terhadap keberadaan orang-orang arab disemenanjung arab, dengan cara memutarbalikkan fakta dan memporakporandakan struktur tatanan sosial yang ada di masyarakat arab saat itu, mereka bekerja membuat banyak tulisan yang menolak bersatunya dua kelompok masyarakat yang berbeda agama, sehingga keduanya saling berseteru dan tidak mau membaur, terutama umat islam kristiani dan yahudi yang kala itu sejak awal sudah ada sejak nenek moyang mereka. Mereka menginginkan dibuatkannya pembatas yang jelas antara beda keyakinan, beda perlakuan dari masing-masing kelompok. Misi mereka adalah menolak segala bentuk pembauran umat beragama, percampuran dalam satu tatanan sosial harus dikotak-kotak dan diberi garis pembatas yang jelas. Menteri Komunikasi dan InformatikaRudiantara menilai, kelompok Saracen tak cukup disebut sebagai penyebar hoaks. Menurut dia, Saracen layak disebut sebagai penyebar kebencian dan pengadu domba. Oleh karena itu, menurut dia, wajar jika polisi menjeratnya dengan berbagai pasal selain hoaks, tetapi juga pasal terkait SARA dan sebagainya. Rudi mengatakan, penilaiannya ini berdasarkan konstruksi konten berita yang disebarkan oleh Saracen kepada publik di dunia maya. “Memberikan berita palsu seolah menyerang suatu kelompok dan mengadu dengan kelompok lain. Jadi ini bukan sekadar hoaks,” ujar Rudi dalam acara Satu Meja yang ditayangkan Kompas TV, Senin (28/8/2017) malam. Jadi bukan karena motif ekonomi semata, memang ada unsur kesengajaan dan tujuan memecah belah bangsa. Ada organisasinya, struktur pengurusnya, dan dana dan modalnya. Kelompok ini terorganisir rapi dan tersembunyi, mereka sudah ada sejak jaman romawi dan berevolusi mengikuti perkembangan jaman, cara kerja mereka sama persis dengan leluhurnya, menyebarkan kebencian dan permusuhan di masyaraka dat agar selalu berkelahi dan bertentangan, mereka bersembunyi di balik ketiak pemilik modal raksasa untuk menciptakan permusuhan dan kegaduhan.